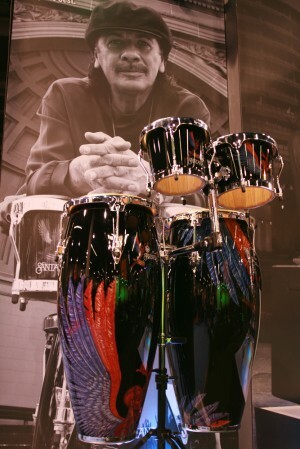 Latin Percussion (LP) showcases a new Santana set. They are beautiful and sound great. Going to trade shows isn’t high on my list of fun ways to send a weekend. At last count there were exactly 1,853 things on my list that out-ranked trade shows. these include going to the dentist and spending a weekend with my mother-in law. However, I have a big weakness for cute musicians so when I was given the opportunity to cover the NAMM show in Anaheim, CA, I just had to go. What is the NAMM show you ask? Well, it’s short for The National Association of Music Merchants and it’s the largest and longest-running musical instruments and products trade show in the United States with a reported 90,114 attendees (at least 1000 of whom are cute) and 1,417 exhibitors (not so many cuties in this category). This is the place where music products retailers meet face-to-face with manufacturers to gain product knowledge and make their biggest purchase decisions. This is also where the manufacturers turn up the volume (literally and figuratively) to coerce the retailers to sell their wares to musicians of all genres. They do this by showing their newest instruments, gadgets and gizmos. Hosting mini-concerts in their booths by their A-list band endorsees, meet-and-greets with big name musicians for those autograph-seeking retailers who wait in long lines and after-show mega-parties with lots of alcohol and rockstars. As a music fan, the first time I went to NAMM many years ago, those meet-and-greets, mini-concerts and after-show parties were a big attraction for me but now they are just a nuisance as they clog up the aisles between where I am and where I want to be and often block my view of an especially cute musician. The Photo Diva is not much of an autograph hound. I am more attracted to the impromptu performances by unsigned/undiscovered musicians who walk into a booth, pick up and instrument and just play. Especially if they are super cute. One of the biggest highlights for me was walking into a booth within the drum section of the trade show floor where one guys was trying out some congas and next thing I knew there was another guy joining in…and then another…and then another. In an instant it was a full-on conga fest with delicious rhythms tickling my ears. Ironically, though it is a gathering that is all about sound and cute guys, my biggest thrill was visual and had nothing to do with cute musicians. My fun surprise was finding a small booth of unique guitar straps that were reminiscent of old-school car upholstery. 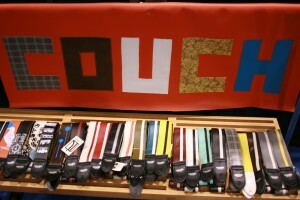 After talking to the owners of Couch Guitar Straps I found out that they are, in fact, made of vintage, recycled materials, vegan and sweatshop-free in the good old US. They also make camera straps (I had seen them recently on Etsy.com), belts and wallets from materials like 80’s Mercedes upholstery and Mustang trunk liner and even vintage seat belts…all at reasonable prices. I will definitely be placing my order very soon because…well..they’re cute. also make camera straps and wallets. Now that I’m back in Las Vegas (and the ringing in my ears is subsiding) I see that my calendar is pretty full. I will again be shooting Funny Bones charity event on Saturday, January 30 at the Palms Casino Resort (read my last review here) which is an all-ages show benefiting Las Vegas area animal rescues in need of assistance. Tickets are available here but hurry as last year’s show sold out. I also have my fingers crossed that this time around I get to shoot and see Domenick Allen’s “It’s All About The Music” on January 29 and 30 at the Suncoast Showroom (read my interview here) if it’s not sold out already. And if you did not already know, he is most definitely cute.